Orange-collared Manakin: An expected bird on the “River Trail” (actually called the “Laguna Meandrica” trail) but always nice to see. 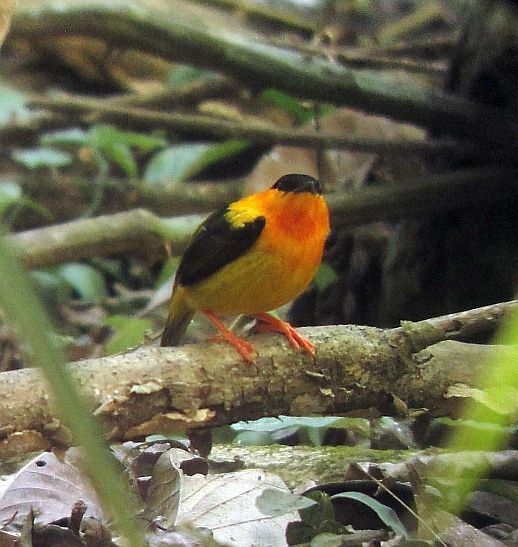 There are two to three leks along the trail and although they aren’t always active, you should run into some fine, Orange-collared Manakin action. 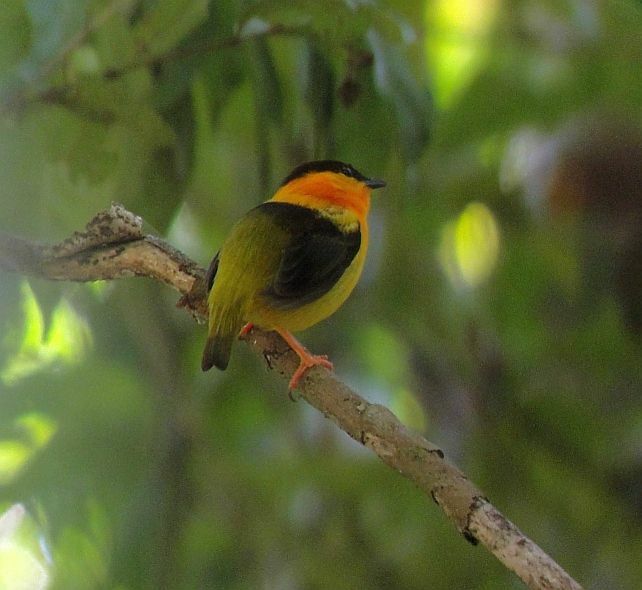 Orange-collared Manakins are a fairly common near endemic because they prefer second growth. The males are avian eye candy at its best. Royal Flycatcher: If you like IOC splits, this is the Northern Royal Flycatcher and they have been showing well on the Laguna Meandrica trail. A pair has built a nest once again over the first stream. Hang out there long enough and one or two will probably make an appearance. While you are waiting, other birds will show up too. This month, I have had Rufous Piha, Baird’s Trogon, Slaty-tailed Trogon, Cocoa Woodcreeper, Gray-headed Kite, and others while awaiting the Royal Flycatchers. 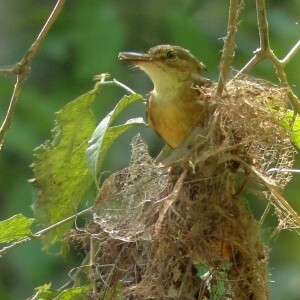 Royal Flycatcher building its huge, hanging nest. Common Potoo (! ): What? 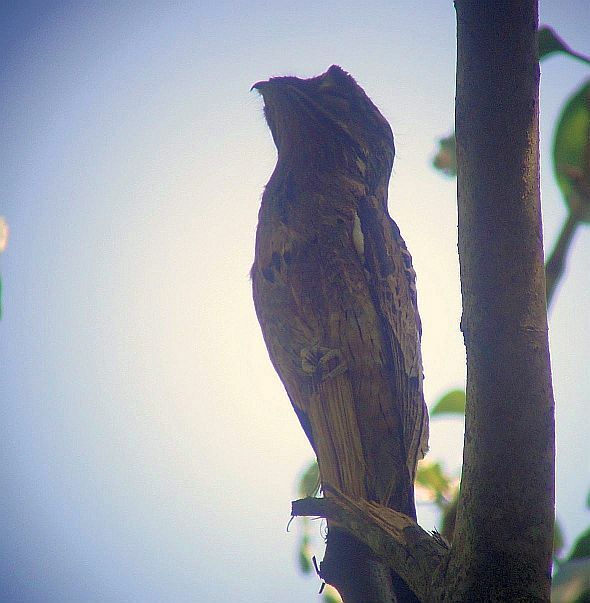 Yes, Common Potoo has finally shown up in the park! They have surely been there all along but the local guides were saying that this is the first one they have seen in the national park. It’s easy to see and, if the marker is still there, watch for a straight trunk lying across the path of the Laguna Meandrica trail about 400 meters in from the parking lot (rough guess) and look to the left (north). Common Potoo- This decidedly uncommon species in Costa Rica is a great bird to get for the year list. Antswarms: You just have to be lucky to run into one of these but I have seen them on the Laguna Meandrica trail on most recent trips there. They can show up anywhere so the more time you spend on the trail, the more likely you will experience the fun of army ants in action. We didn’t see anything rare but it was still nice to get close looks at the usual suspects: Northern Barred Woodcreeper, Tawny-winged Woodcreeper, Bicolored Antbird, Chestnut-backed Antbird, Gray-headed Tanager, and Riverside Wren. Outside the national park, the birding has also been great. I had my biggest surprise two weeks ago when we ran into a Tiny Hawk on the Cerro Lodge road! When we saw the bird, even though I had a good look at the tail, my mind kind of refused to believe that it was a Tiny Hawk and so I was calling it a Barred Forest Falcon (the head looked rounded and the mind plays tricks when it doesn’t want to accept something that “shouldn’t” be there). It was most definitely a Tiny hawk though and the first I have seen in the Carara area. I told Randall Chaves Ortega about it and this veteran, excellent birding guide said that he has seen them on three occasions during 12 or so years of guiding and birding at Carara, including one that showed up on the lower part of the Cerro Lodge road. Although the habitat is a bit dry, it does have the type of semi-open character that they like. Whether a rare resident or a species that wanders through that area from time to time, look for it on the lower part of the Cerro Lodge road! It’s also a reminder to think outside the box when birding at Carara since other mega species that aren’t “supposed” to be there have also shown up in the park (Rufous-vented Ground Cuckoo) and Agami Heron (Tarcoles mangroves). 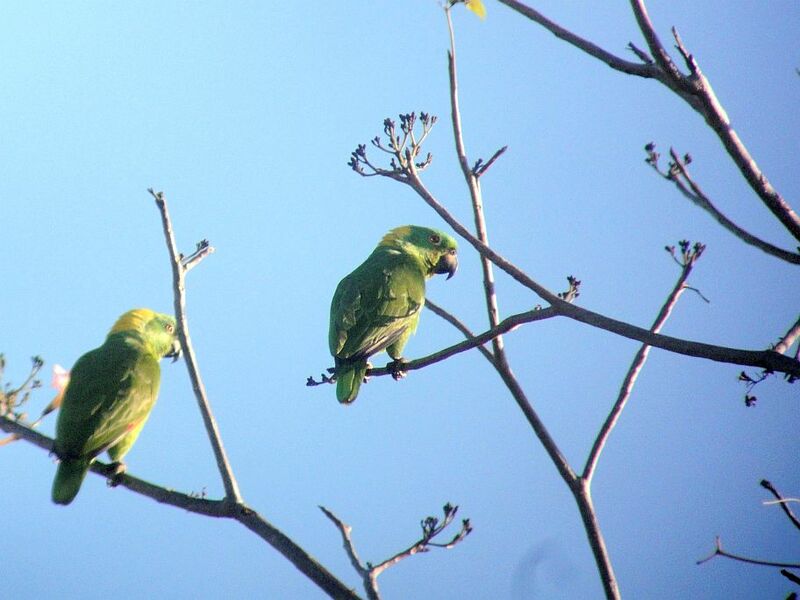 Yellow-naped Parrot: Pretty much expected but shows that the Cerro Lodge area and Tarcoles are good sites for this uncommon species. These two birds were calling and hanging out just outside of Tarcoles. Mangrove birds like Mangrove Vireo, Panama Flycatcher, and Northern Scrub Flycatcher are showing well in mangroves around Tarcoles. 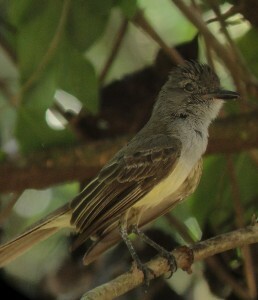 The Panama Flycatcher is much more common in Panama but shows up in mangroves in Costa Rica. The Guacimo Road has been pretty good for dry forest species including White-throated Magpie Jay, Banded Wren, Orange-fronted Parakeet, and White-fronted Parrot among other birds. 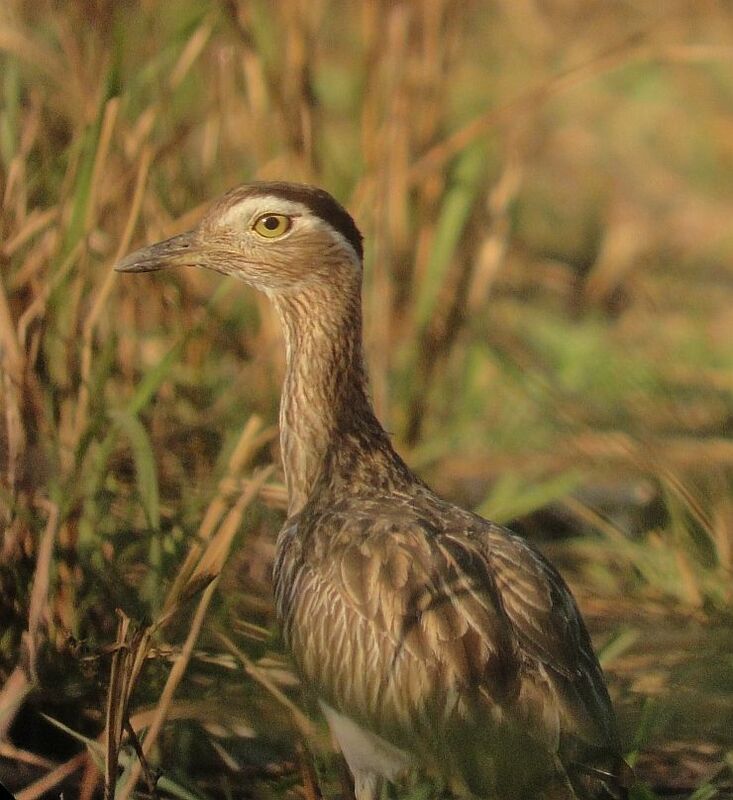 Lesser Ground Cuckoo has been especially responsive and showing well at several areas along the road and a recently burned field with new grass shoots has been hosting at least 4 pairs of Double-striped Thick Knees. Down in the riparian zone, there are plenty of birds including Olive Sparrow, Turquoise-browed Motmot, and others. It was strange to not find Plain-breasted Ground Dove there two weeks ago and then see several a week later. Long, productive days of guiding around Carara have turned up day totals of 140 species seen and 160 plus birds heard on more than one of these recent occasions. Those memorable birding days have pushed my year list up to 450 species. Given that I have done very little highland birding and have yet to bird the Caribbean lowlands, I should edge past 500 in no time, especially since I plan on birding down at Manzanillo very soon. Good birding and hope to see you somewhere in Costa Rica! We absolutely love your blog and find nearly all of your post’s to be just what I’m looking for. Does one offer guest writers to write content for yourself? I wouldn’t mind writing a post or elaborating on a number of the subjects you write in relation to here. Again, awesome website! 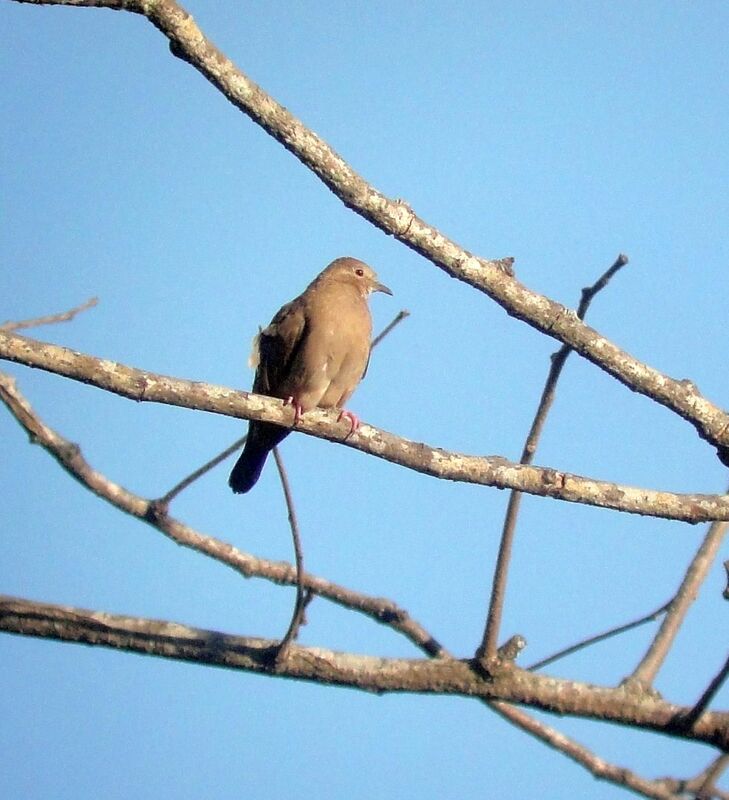 @Jay- I have never seen or heard of Turquoise Cotinga being seen there but Yellow-billed is regular way off in the distant mangroves- looks like a small white dot. 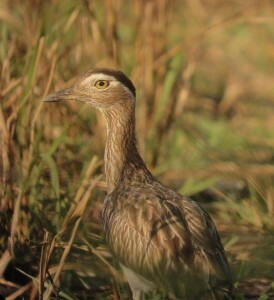 I have occasionally seen single birds on the Cerro Lodge road and near the lodge itself as they move between the mangroves and the riparian zone along the Tarcoles River. Thanks for such a wonderful website and blog. We are two birding Brits making our fourth trip to Costa Rica in May and your website has told me more than any ‘Where to Watch’ book has. Can you tell me exactly where the Guacimo Road is. Thanks and keep on with the good work. @Kath- Very glad to hear that the information on the blog has been helpful. To get to the Guacimo Road from San Jose or Carara, take the highway towards Caldera. After the exit to Orotina, you pass through a toll booth. Stay on the highway for about 4 kilometers and take the exit for Ceiba (might also say Guacimo). Just after exiting the highway, take an immediate left, and go over the short bridge (looks like a one way but is not). You will now be on the Guacimo Road. Hope you have a good trip!